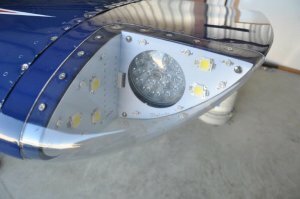 We have made a Flyleds kit to suit W415 wingtips that has been fitted with a modification kit from RMD Aircraft Lighting. It will drop into place where the original cover plates went. Our customer pictured below chose to change their PAR-36 light with an aftermarket LED product at the same time. Select RV-4/6/8 LG when you place your order!